LAS VEGAS, Nov. 5, 2013 – Hyundai today announced the creation of a new factory crate engine program at the 2013 SEMA Show in Las Vegas. Under the program, the Lambda 3.8-liter, direct-injected V6 and Theta 2.0-liter, turbocharged 4-cylinder engines will be offered to aftermarket tuners at a significantly lower cost than an equivalent replacement engine. The new engine program begins availability in December 2013. The 2.0-liter 4-cylinder will be available in two engine configurations: a turbo-ready version priced at $4,500, and a turbo-equipped version, which includes turbocharger, intercooler, and intake air ducting, priced at $6,000. The turbo-ready version was developed specifically for tuners planning more aggressive, aftermarket-based turbocharging solutions, eliminating the costs associated with redundant turbocharging components. The 3.8-liter direct-injected V6 will be offered at $9,000. Both 2.0- and 3.8-liter crate engines include intake manifolds, ignition coils, injectors, and fuel delivery assemblies. 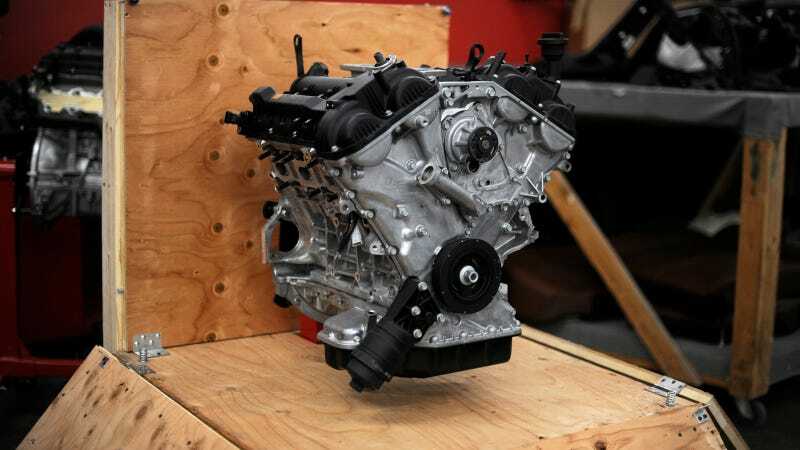 The cost advantages of the crate engine program are achieved via distribution system efficiencies and sub-assembly packaging when compared with the long block replacement engine and its individual sub-assembly cost. "As more Genesis Coupes have entered the pre-owned enthusiast market since its 2009 launch, we've witnessed strong interest in leveraging the low cost potential of this rear-drive platform and its powertrains for the tuner market and motorsports," said John Krafcik, president and CEO, Hyundai Motor America. "Now, with our new crate engine program, Hyundai is making it more affordable for these same enthusiasts to modify their Genesis Coupe, or perhaps inject some high-value horsepower into other platforms." These 2.0- and 3.8-liter Hyundai engines represent the powertrain options for the popular rear-drive Genesis Coupe, a favorite in the performance tuner community. In recent years, tuners have proven the scalable power gains possible from these engines with a variety of modifications. The full spectrum of modifications spans from the common, like intake and exhaust, to the most advanced, involving internal engineering of pistons, valves, rods and cranks. At the SEMA show Hyundai announcement, famed tuner Bisi Ezerioha, creator of the 1,000-horsepower Bisimoto Genesis Coupe, was thrilled to be the first tuner to take advantage of Hyundai's new crate engine program, saying, "Hyundai makes impressively robust engines throughout its line-up, so the addition of this crate engine program is sure to raise tuner enthusiasm for radical Hyundai modifications even more. "At a rock-bottom $4,500, the Hyundai 2.0-liter turbo-ready engine represents an extremely attractive proposition for standardized spec-engine development, such as those developed for spec-based racing series. For comparison, the Ford 2.0-liter EcoBoost 4-cylinder engine with similar factory output characteristics has an MSRP of $8,000. Hyundai crate engine kits will be sold only through authorized Hyundai dealerships. These engines are covered by Hyundai's 12-month/12,000 mile replacement parts warranty policies and do not fall under the 10-year/100,000 powertrain warranty that applies to new Hyundai vehicles.